I was recently looking to see if there was anything new with Squaready, an app that fills around ‘not square’ photos so they can be posted to sites that require square. 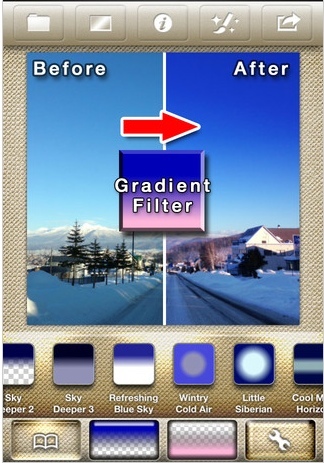 Looking over the developers work, I saw they did an app for applying different gradient effects to iPhone photos. Normally, I think of gradients as simply a light to dark area fill, particularly when I want an area of a photo highlighted more than other areas. Looking over the examples their app had, it got me thinking about the many other natural and un-natural enhancements that can be done to a photo. The app, Gradgram – Fast Gradient Image Editor for Instagram, Facebook, Twitter – …. (serious, that is the apps name!) is an iPhone only app that can be yours for less than a US dollar. Uh, I still can’t get over that name. Back to gradients. 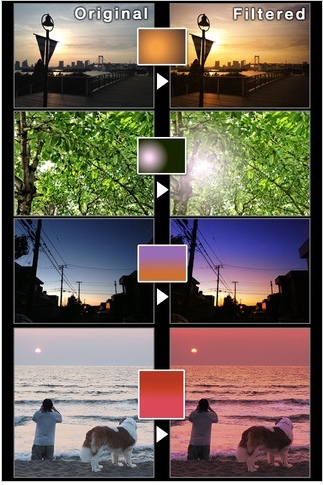 The app allows for the application of gradients colors that you choose from a picker, then apply from an area to another using a horizon or even circle areas. Then share the finished result directly out through the sites mentioned in the app’s name but also to other apps like Camera+ if you want to do additional editing. Looking over Gradgram’s examples, it gives me a few ideas to play with photos I recently took of interior rooms that would pop with the proper area shading.